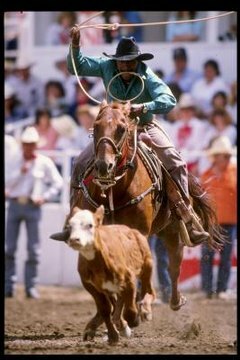 The purpose of calf roping is to catch the calf. On a working farm, calf roping is a practical skill that is used to enable farmers to single out a specific animal from the herd as needed. In rodeo, calf roping is done for competition to show off the cowboy's skills. Calves are roped by their front or hind legs, pulled down by the horse, and then the rope is secured to the saddle so that the calf is fighting against the weight of the horse and saddle. The practice of securing the rope to the saddle is called dallying. Rope the calf successfully. Hold your rope loosely between the thumb and index finger of each hand. Keep approximately 1 1/2 feet of rope between your hands. Place your left hand within two inches of the saddle horn. Loop your rope quickly around the base of the saddle horn using your right hand. Complete at least three full loops around the horn to dally wrap the rope properly . Release the rope as the calf pulls it tight. Do not let your hands get caught between the rope and the saddle as the slack is removed from the rope. Maintain a tight rope between the calf and saddle until you have secured the calf as necessary.